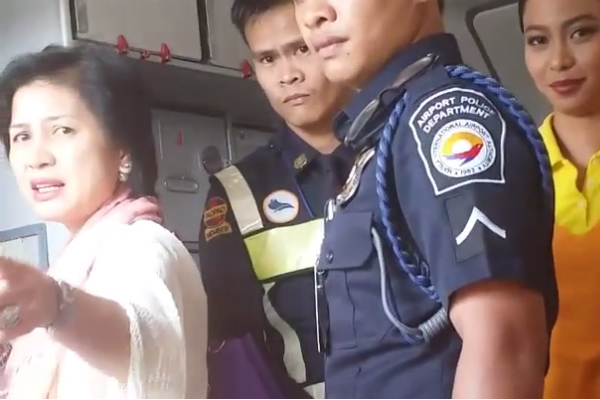 Aviation Updates Philippines - A Cebu Pacific Air flight to Pagadian returned back to the Ninoy Aquino International Airport Terminal 3 after Melissa Mendez, a character actress, showed unruly behavior while the plane prepares for take-off. The actress was escorted by 20 Aviation security personnel. Screengrab from Andrew Wolff's Instagram account. According to reports by the media, Mendez refused to accept the seat given to her after she was requested to move from a seat reserved for another passenger. The 50-year old actress said to have punched a flight attendant. She continued to curse a Philippine rugby player's friend. Andrew Wolff said Ms. Melissa was given three warning by the Cebu Pacific staff, but did not stop. "She punched my friend and the flight attendants and had to be restrained. The captain announced: Ladies and Gentlemen, I apologize, but we have to go back to Manila due to one unruly passenger," a part of Wolff's statement said. Cebu Pacific said that Flight 5J 771 departed Manila at 9:20 AM and arrived Pagadian at 10:37 AM. The airline is currently coordinating with the authorities. "Ang mga taga-Cebu Pacific na po na walang kinakampihan ang makapagbigay ng totoo, walang labis at walang kulang na salaysay [The people of Cebu Pacific will be the only one to determine the true cause of the incident, no excess and no missing information]," Wolff said in a statement.